None of the games involve UP, but the WCC should really be thanking BYU for having its own TV network and broadcasting all of its own sports. Have NEVER been to a volleyball match at UP, but like any competition, if you know the participants, the more likely you are to enjoy the sport. Had the opportunity to chat with 6'3" Beth Carey from Adelaide, Australia the other day. Beth has yet to begin classes at UP, but is a junior, having just transfered from College of Southern Idaho (a JC). I mention this because as the season progresses, and we have the opportunity to meet more of the student/athletes, I think more of us we will be interested in volleyball beyond the beach variety we see at the Summer Olympics. The Pilots are on the road in Utah this weekend for four matches, but return home on August 31 and September 1 in the Nike Classic against Idaho State, Tennessee State, and UNLV. How can you NOT like this group of student/athletes? Head coach Joe Houck returns 12 letterwinners this year in addition to adding three players to a squad that led the nation in sets per match last season (4.14). I'm not sure if that's a meaningful statistic, but it's what UP is claiming! Our VB team lost in straight sets to Utah State and in four sets to Weber State today. I'm not sure how our Pilots got mixed up with all these Utah folks, but tomorrow they take on Southern Utah and Utah in an attempt to get their first win of the year. DoubleDipper wrote: I'm not sure how our Pilots got mixed up with all these Utah folks, but tomorrow they take on Southern Utah and Utah in an attempt to get their first win of the year. They DID get there first win in straight sets over Southern Utah, but then later in the day lost in straight sets to Utah. So, the Pilots come home with a 1-3 record to play in the Nike Portland Invitational next Friday, August 31 at 11 AM against Idaho State. Later on Friday they play Tennessee State at 7:30 PM, and then UNLV at 7:30 on Saturday. Not to be outdone by the men's and women's soccer teams, the VB Squad won twice today, beating Idaho State and Tennessee State, both games by the score of 3-2. The VB ladies (3-3) next take on UNLV tomorrow night (Saturday) at 7:30 PM in the Chiles Center. A clean sweep by the Pilots today... volleyball x2, MSOC & WSOC! Add a Timbers win on top, and it is a good day in the Rose City! I think the VB team learned somthing this weekend........if you gut it out for five sets, you have a good chance of winning. There was some pretty inspired play for UP's upperclassman, all veterans of many five set matchs over the last couple of years....the result a 3-2 victory over UNLV and winning the Nike Portland Invitational. Next HOME game, Tuesday September 11 @ 7:00 PM in the Chiles Center against UW. 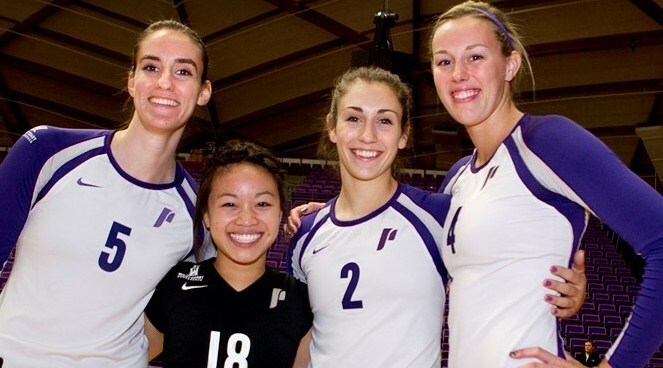 PORTLAND, Ore. --- Portland senior middle blocker Rachel Femling accounted for the final two points of the match, capping off a career night from fellow senior Ariel Usher as the Portland Pilots extended their win streak to four matches with another five set victory. The win (25-23, 26-24, 22-25, 23-25, 15-13) over the UC Santa Barbara Gauchos came in the first match of the Sheraton Airport/Comcast Lobo Invitational Tournament at the Johnson Center Gymnasium Friday night. After a kill from senior outside hitter Kate Bostwick put the Pilots (5-3) on top 13-11 in the final set, Femling stuffed a UCSB attack for her third solo block of the match. A Gaucho (5-4) kill trimmed the Pilots’ lead back to 14-12, but Femling answered immediately by depositing a kill into the right back. “Ariel and Autumn were warriors,” Portland head coach Joe Houck said following the match. “We got key contributions from all corners of the roster in an outstanding match with a quality opponent.” Four Pilots recorded double-digit kills to give the Pilots their first four match winning streak since the 2004 season. Usher and Femling opened the gates by lighting up the scoreboard in the first two sets with Usher posting seven kills in the first and three in the second set on .500-plus attacking percentages. On the night, Usher recorded 21 kills on a .432 attacking percentage. Femling accounted for three kills and one block in the first set before a three block, two kill second set. 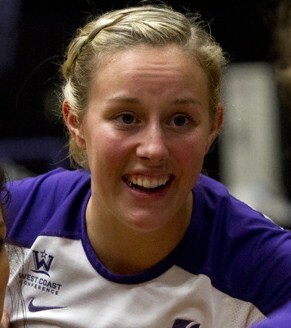 Femling nearly posted a double-double with eight kills and seven blocks in the match, contributing four digs as well. She now has 35 blocks in 33 sets this year. Junior outside hitter Autumn Wedan was once again a stable source of kills for the Pilots with 16 on the night and providing 11 digs for her second double-double of the year. After earning Nike Portland Invitational MVP honors last weekend by leading the Pilots to three consecutive five-set victories, Wedan came through in the clutch again in the fifth set with four of the Pilots eight kills in the set. Congrats on a big win! It would have been nice to finish the Gauchos off in straight sets, as the Pilots were up 2 sets to nil, and then up 19-13 in the 3rd set before UCSB came back to win the 3rd, 25-22 (ouch). Nonethless, a win! A solid start to the season for the Pilots! The Pilots lost to host New Mexico 3-0, and then to Georgia Southern 3-1 today in Albuquerque, in a tournament that featured some pretty high level teams including UCSB, beaten by UP last night. Portland head coach Joe Houck noted. “It is asking a lot to play back-to-back matches at this level of play, and I am very proud of how our team handled difficult situations this weekend. Portland will play its last home non-conference match of the season on Tuesday at 7 p.m. against the No. 7 Washington Huskies before heading to the Penn State Tournament next weekend. We often write about how tough the Mens BB schedule is.....tonight the Volleyball team (5-6) lost 3-0 to UW, ranked 5th in the nation. And on Friday they take on the #2 team in the nation, Penn State. As expected, the Pilots lost to #4 Penn St on the road this evening, 3-0. The Pilots next play Eastern Illinois (3-7) at 10 a.m. (PST) and then immediately conclude the tournament against Duquesne (9-4) at 1 p.m. Duquesne swept Eastern Illinois earlier Friday. Another 5 set win for the Pilots today against Eastern Illinois. But, now they play Duquesne in about an hour. That's rough. Edit: the scoretracker is backwards in terms of matching the logos with the appropriate players. So, I cannot be certain anymore. But, according to Twitter we are 5-0 in 5 set matches this year and we won. So that's that I guess. I haven't seen it in print anywhere yet, but I understand UP lost to Duquesne 3-1 in UP's final match today. Coming out of the Penn State tournament with a 1-2 record was probably as good as we could have expected. Starting WCC play on the road against Pepperdine next week will probably be another "growing and learning" experience for the team. They should have a better chance against St. Mary's two days later. So, after having started the season with such good wins, we have yet to win a match in WCC play and are currently looking at a 6-17 record. The girls have won 4 sets in WCC play to 27 loses and have posted a score of either 0-3 or 1-3. Does anyone think that some change is needed to develop a better program or is this just a lack of luck? RipCityPilot wrote: So, after having started the season with such good wins, we have yet to win a match in WCC play and are currently looking at a 6-17 record. The girls have won 4 sets in WCC play to 27 loses and have posted a score of either 0-3 or 1-3. Does anyone think that some change is needed to develop a better program or is this just a lack of luck? No, not a lack of luck, a lack of priority! I don't know a lot about VB except that height and teamwork play a big part. I believe our coaching is good, but face it, compared to our competition our players are just shorter and less athletic....kind of like our basketball teams have been at times (men's and women's). Recruiting a stellar student who is also a stellar VB player has been difficult to do in any numbers or with any regularity. I would venture to guess the recruiting budget to this point has been lower than any school in the WCC…..and we have very little VB tradition. I’ve gotten to know the coaches over the years, and they’ve all seemed to be top notch people, but it’s my perception the university does not give VB a lot of priority and it is treated more like a club sport. Seniors Orchestrate Thrilling Five Set Victory over Gonzaga in Season Finale. It was obviously a very tough year for the young volleyball squad, but in their last opportunity to finally win a WCC match this season, they prevailed against Gonzaga last night.....a good way for the seniors to have fond memories of their time at UP. Senior outside hitters Kate Bostwick and Ariel Usher combined for 38 kills while hitting over .350 to help lead the Pilots to a come-from-behind 3-2 victory (19-25, 22-25, 25-21, 25-14, 15-11) over the Gonzaga Bulldogs Thursday night at the Martin Centre. Fellow senior Rachel Femling tallied her fourth career 10-block match, in a match-up that was dominated by Portland’s seniors. Portland (7-23, 1-15 WCC) carried all the momentum heading into the fifth set with a powerful display in the fourth set in which Usher tallied six kills with Bostwick adding four.